I think it’s pretty safe to say that every tried and true metalhead in the world has a particular album that they always go to as the soundtrack to their aggression. Usually, it’s an album that’s pure pissed-off fury contained on a tiny compact disc (perhaps a cassette or vinyl album, depending on your age) that’s best as listening material while you punch holes in walls or resort to good ol’ fashioned headbanging, preferably against a very hard object. This would be a perfect description for Kreator’s Pleasure To Kill, the infamous nine-track cacophony of Thrash Metal mayhem that features some of the most aggressive music ever made by mortal(?) men. But while PTK is little more than a few great Thrash songs that are perfect to play while slaying (Insert name of person/people you despise most here), the follow up to that album is a little something more. With major improvements in sound (particularly in musicianship and production) along with a more solid and well-defined direction, Terrible Certainty arrives just when you thought the Pleasure To Kill dust had finally settled to create an entirely new storm altogether. First off, I’ll address an issue you might’ve been pondering over since even before you clicked on this review: “Why is this not a classic review?” I mean, all things considered it should be. It’s my all-time favorite Kreator album for one thing, and definitely one of their most solid records; they seem much more comfortable with their sound here than they did on their first two albums. I think the biggest reason for Terrible Certainty’s non-classic status is that it is overshadowed by two of the band’s most famous records, Pleasure To Kill and Extreme Aggressions, which it unfortunately lands right in between. And of course, after Extreme Aggressions came the groundbreaking Coma Of Souls, and thus many Kreator fans will likely look right past Terrible Certainty in Kreator’s discography. But make no mistake; TC is an absolutely vital record in their catalog, and deserves to be picked up by any self-respecting Thrash Metal fanatic. And now, onto the album itself. Much like Pleasure To Kill, Terrible Certainty is not for the faint of heart. This becomes painfully clear after listening to just the first ten seconds of the record. Blind Faith immediately accelerates to faster-than-light speed just moments after its opening drum fill, kicking your arse all over the place and leaving you to wonder just what in Mille Petrozza’s name happened. The track is so insanely fast and the tempo changes throughout the song are so abrupt that mark my words: If you’re new to the realm of Thrash Metal, you WILL be left behind. Terrible Certainty was one of the very first albums to vaporize my ears when I first started getting into Thrash, and I can’t count how many times I listened to Blind Faith in vain before I finally “Got it”. But once I did, the technicality and the sheer shreddy-ness of it awed me so much that it quickly became one of my favorite metal songs ever. Other incredible songs follow afterwards, from the classic Storming With Menace, the title track with its fantastic tribal drum intro and awesome lead riff, Toxic Trace with its mid-paced beginning before changing into a blisteringly quick thrash track fifty seconds in, and Behind The Mirror, which has one of the greatest and most misleading intros ever: A clean guitar distortion playing an ominous and sorrowful riff before stopping and breaking into one of the best tracks on the album. 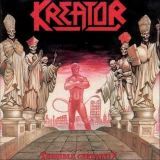 Without a doubt, Terrible Certainty was Kreator’s most diverse record at the time of its release, and a key turning point in their sound; this is where the melodic elements that the band is well known for today first came into play. They’re much more subtle here than on, say, Coma Of Souls, but they’re still there, and it adds greater depth to the record. Sure, Pleasure To Kill is more aggressive, but for me, Terrible Certainty is the soundtrack to my aggression. It definitely has a more solid sound with a much slower tempo overall, but the PTK sound does sneak in on a few tracks, and these songs sound just as great as the ones found on that album. Go ahead and mosh your nuts off with Pleasure To Kill, mindlessly thrashing around and destroying everything in sight, but I personally like for my anger to have a little more point to it.